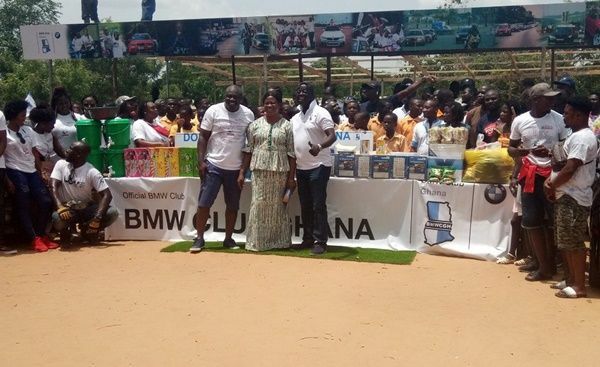 Bavarian Motor Works (BMW), owners and lovers club of Ghana has embarked on a humanitarian mission to support Sogakope DA Basic C School as it marks its one-year anniversary. BMW Club Ghana, donated a modern canteen edifice and other ancillary to the school with the aim of helping to ensure that students have a hygienic environment to eat and learn. One Child, One Book (1C1B) Project, the main Corporate Social Responsibility (CSR) initiative of the club, also donated about 500 branded exercise books, text books, mathematical sets and dictionaries to the school. Other items donated to the school include; hand washing bowls and buckets, shoes, dresses and foodstuffs as well as bags of sachet water. The donation event was held concurrently with Drive Tours (DTs), a quarterly activity of the club during which they embark on a long distance drive as a form of exercise and for fun. The President, BMW Club Ghana, Benjamin Kwadwo Oppong, indicated that the club was officially accepted and certified by the African BMW Club about a year ago and as part of its one year anniversary celebration activities, decided to support the school with that project. “…as a car club, driving forms part of our major activities which is dubbed Drive Tours…so, we drive on long distance journey and tour the country which is also a form of tourism. We have previously been to Kumasi, Akosombo and Takoradi. “Usually on our drive tours, we add some humanitarian activity to it so that we can be able to benefit others in the communities we visit. We have previous done a donation to Kumasi Children Home, branded vest and reflectors to Ghana Police Service, and also paid tolls for about 3000 drivers at the Tema Motorway. "This time around we decided to drive to Sogakope so we adopted the Sogakope DA C School and we realised that their canteen was very deplorable so we actually built a new canteen for them and provided them with white boards in their classrooms,” he said. The Headmistress, Sogakope DA Basic C, Justine Dorglo, expressed her profound gratitude to the Club for the assistance but also made an appeal to corporate Ghana and government to come to their aid as the school also lacks library and computer laboratory. “BMW Club Ghana came to us some few weeks ago that they want to help us and at the time our deplorable canteen was a major problem to us, so they promised to provide us with a new one and thankfully, today they have fulfilled their promise. “The books, 10 white boards among other items provided, will go a long way to enhance academic works and the modern canteen facility will also protect our students from contracting diseases like cholera and diarrhea,” he said. BMW Club Ghana is basically for owners of BMW automobile. However, membership is opened to anybody who is a lover of the brand. The General Secretary of the Club, Wellington Kwadwo Oppong, indicated that the club apart from the social activities also provides technical assistance to members who are facing challenges or have issues with their vehicle.